Any attempt at Indian clothing for this feast is deeply appreciated. If you would like to explore actual medieval Indian garb, there are many choices. In much of medieval history everywhere, social station dictated your choice of clothing. In 15th century India, these social variables included religion, ethnicity, place in society, profession, and geographic location. The most obvious though is religion. Muslim women in the courts of Ghiyath Shahi wore the latest fashions from Persia, considered the pinnacle of Islamic culture at the time. They wore long light coats and a wide range of veils and even small turbans of many colors. They wore elaborate plaque belts or wide fabric sashes and much more jewelry than their fashion-setter sisters to the North. 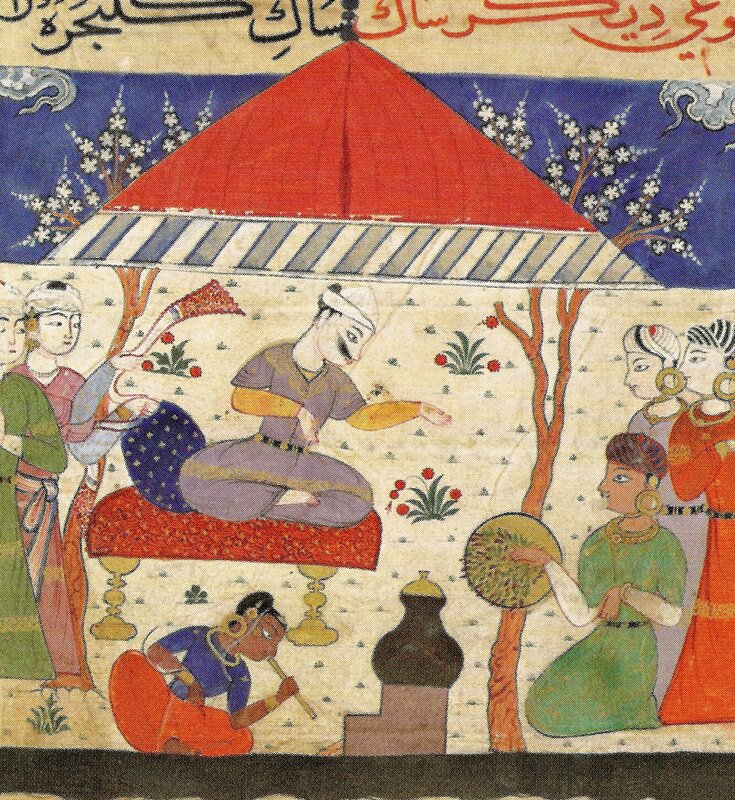 Hindu women appear in the manuscript both as cooks and as wives or concubines, elaborately coiffured, but nowhere near as often as the Muslim women. It is not entirely clear in the manuscripts whether the Hindu women are wearing sewn drawstring skirts or pants-wrapped saris, so either choice is “correct”. Pants-wrap saris are comfortable and easy to move in, and can be combined with a contrasting veil to cover your upper body if you wish, as can skirts. The choli or kanchala is the only upper garment, though the choli has many styles and can be simple or heavily decorated. 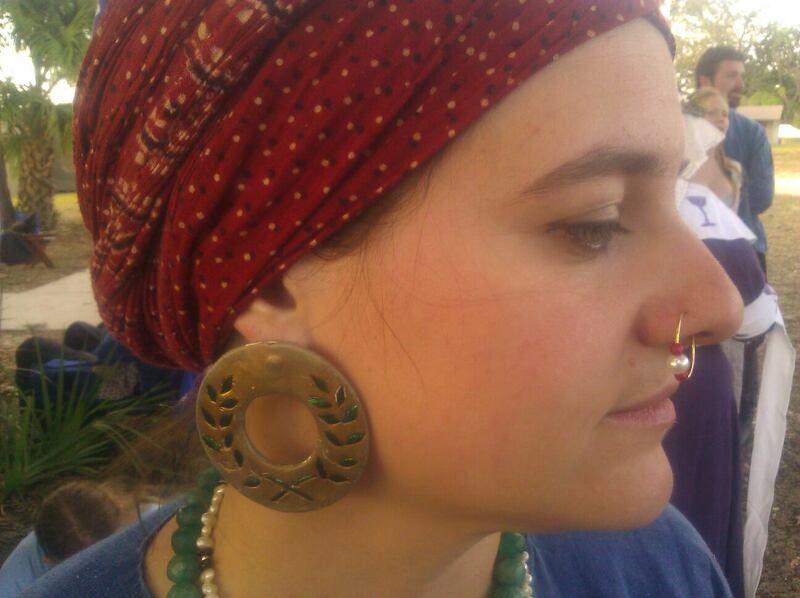 Jewelry is possibly more important than the clothing, and should be as abundant as possible. The Persian style was ubiquitous for Muslim men but was also common for Hindu men. The man’s outfit of tapered-leg drawstring pants, long loose crossover coat, and waist sash with a colorful wrapped turban is simple to construct and comfortable. Outside of Muslim-ruled areas men often wore the traditional dhoti, a pants-wrapped length of cloth, sometimes with a simple shirt and uttariya (shoulder scarf). Men of both religions often wore jewelry including arm bands, jeweled turban pins, beaded necklaces, and heavy rings. Portuguese and Spanish Catholics, Nestorian Christians from Africa, Jews from Syria… people of all of these religions either traveled through the subcontinent or had established communities there. Buddhism and Jainism were both founded in India and had many followers during this time. Information on the clothing of the less-common religions is more difficult to find, but established communities would be more likely to dress like the Hindus than the Muslim invaders. Please see the links page for vastly more detailed information.